Aldo Lado's unofficial sequel to Wes Craven's 'The Last House on the Left' is one of the first Blu-ray titles coming in the new year. 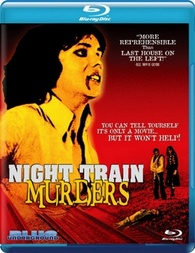 In an early announcement to retailers, Blue Underground will bring 'Night Train Murders' to Blu-ray on January 31. The 1975 cult Italian horror film is about two teenaged girls who are terrorized on a train traveling from Germany to Italy and features a score from composer Ennio Morricone. Specs and supplements are still forthcoming, and suggested list price for the Blu-ray will likely be $34.98. You can find the latest specs for 'Night Train Murders' linked from our Blu-ray Release Schedule, where it's indexed under January 31.